Whether I’m traveling solo or with family or friends, my favorite travel memories are always about the people I meet. 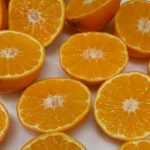 I was really fortunate to have had so many of those in 2017—made possible through a combination of travel planners who had deep roots in the places I was visiting, excellent local guides who knew how to remove that often-awkward barrier between the visitor and the visited, and my own tendency to strike up conversations with anyone and everyone around me. Below are just a few of the special moments I got to experience in 2017. 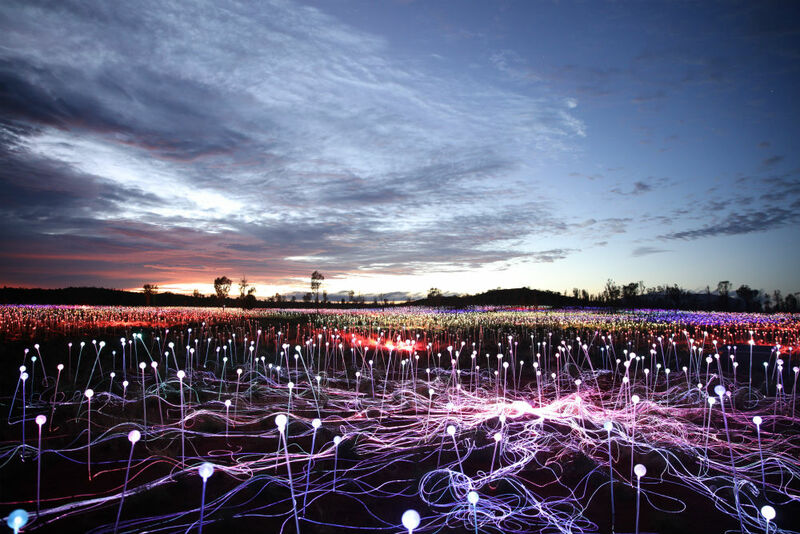 Here’s hoping that my trips inspire ideas for your own adventures in the coming year. 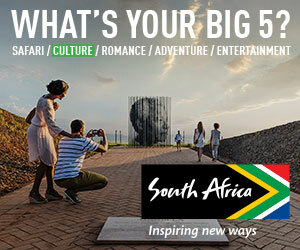 I worked with a few of our WOW Listers to plan parts of these trips, so contact us through Ask Wendy if you want more information on how to make them happen for yourself. These men were shopping for camels. The Pushkar Camel Fair was the reason I wanted to go to India. I ended up loving the amazing history and sights, not to mention all that delicious vegetarian food, but India wasn’t high on my list until I learned about Pushkar from Sanjay Saxena at last year’s Wendy Perrin Global Travel Summit (btw, we’re doing the summit on social media this year so that you can all be involved—stay tuned for more info on #WOWWeek soon!). Anyway, the Pushkar Camel Fair is an annual trade market for camels and horses that draws Indian farmers from around the country, but it’s also a festival with a sprawling outdoor market, a sandy fairground where families set up tents and hobble their camels and horses, and a big arena that hosts an opening-night flag ceremony and various competitions. But the best part is simply being able to wander around the fairground and watch as the families (many of whom have traveled far distances to be here) tend to their tents, cook their daily meals, and buy or sell their camels. The trading was the most fascinating part of the festivals. But it was pretty subtle: just a bunch of men standing around talking about a camel or a horse, not all that different from groups of men standing around talking about the weather. Our guide, Kapil, however, had a keen eye for this and would discreetly direct us near sales meetings. One evening, we watched a duo of potential buyers size up some animals and then walk away. Thinking that the show was over, my friend and I quickly got distracted with other sights and photo ops, while Kapil strolled off to look at something else—we thought. Next thing we know, he’d made friends with the would-be buyers and all three of them were strolling back to us. The conversation that followed was such a natural interaction; it didn’t feel forced or voyeuristic the way some tourist-meets-local moments can, and that was all down to our guide’s natural ease and experience. 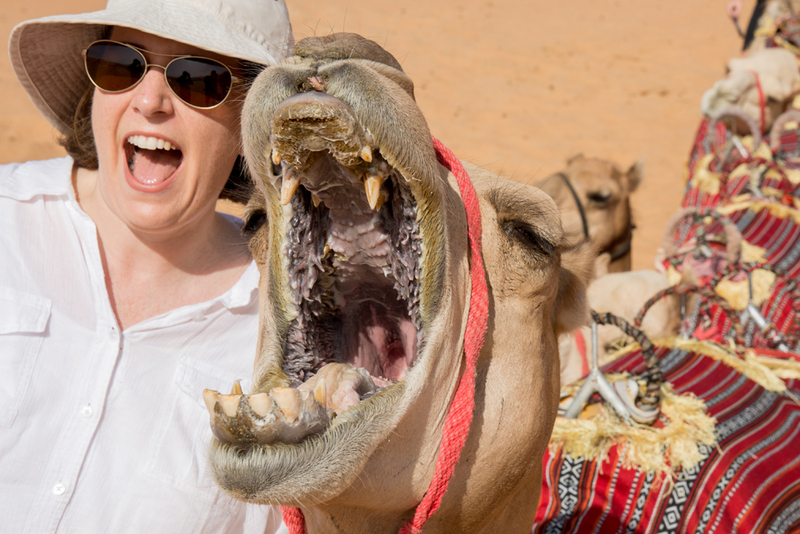 He knew we wanted to learn more about the camel culture and he helped us learn about it, not through a “tour” or scripted guide-bookish lectures, but by nonchalantly making friends and then making those friends our friends. 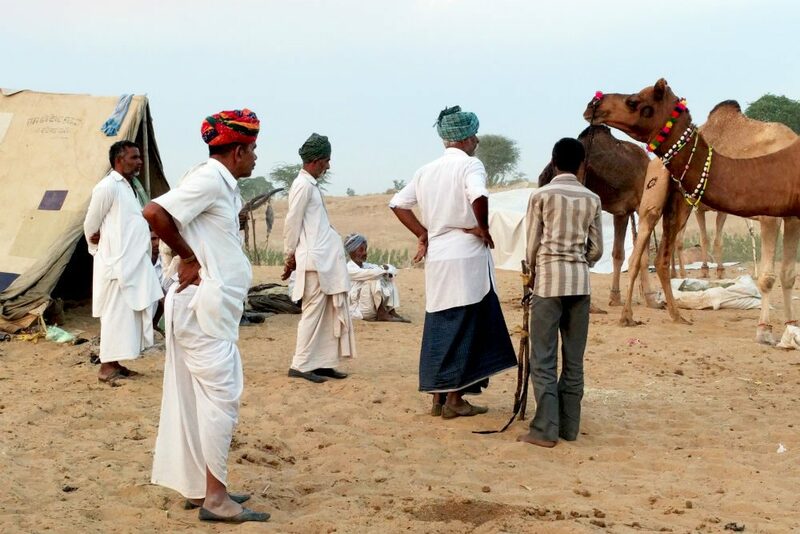 The men explained that they determine the value of a camel by patting its flanks and humps and counting number of teeth to determine age (young animals are more desirable but also more expensive). They had liked what they saw, but wanted to shop around a bit more before buying the two camels we’d seen them with before. Just look at all those flavors—and this was only a quarter of the options. 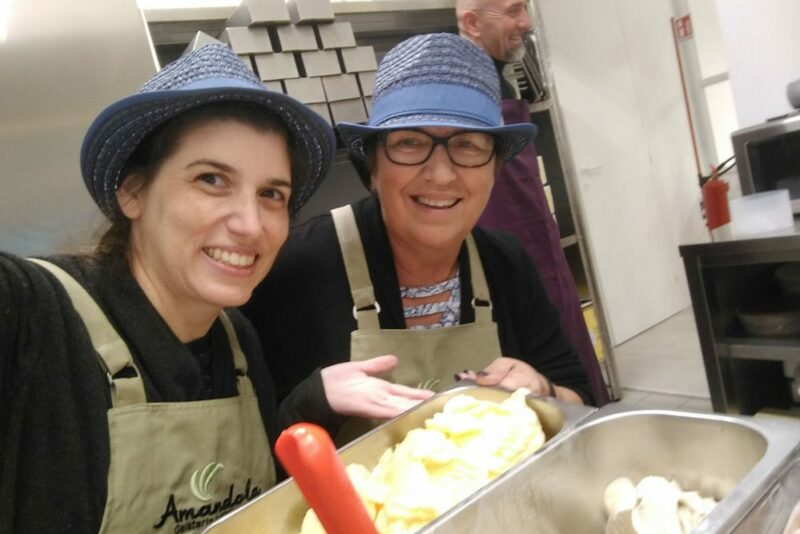 Hats are part of the uniform at Amandola Gelateria, and we got our own! 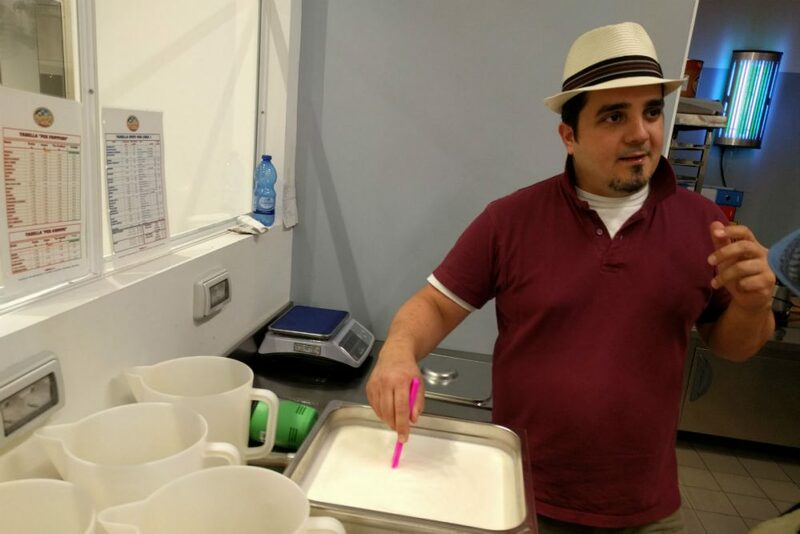 Ricardo shows us how he makes the base for all his gelato flavors (except the sorbet, which don't have cream). 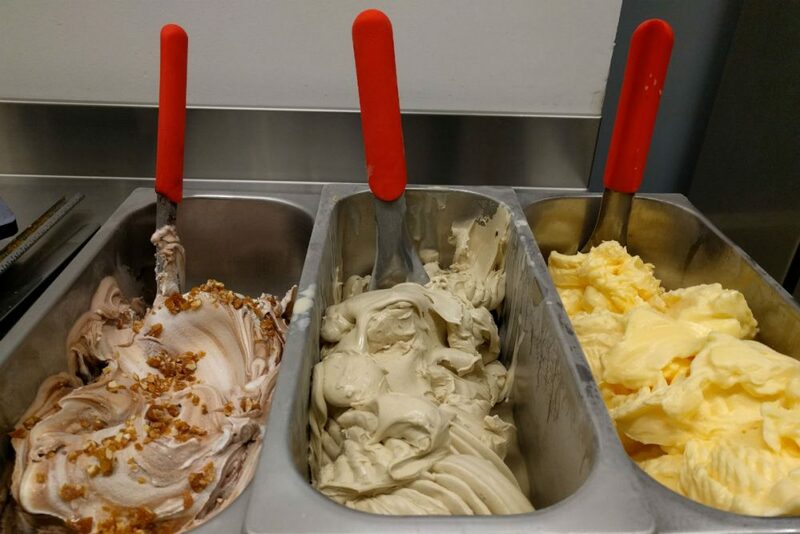 These are the three flavors we made: Nutella with candied almond crunch, natural pistachio, and clementine. 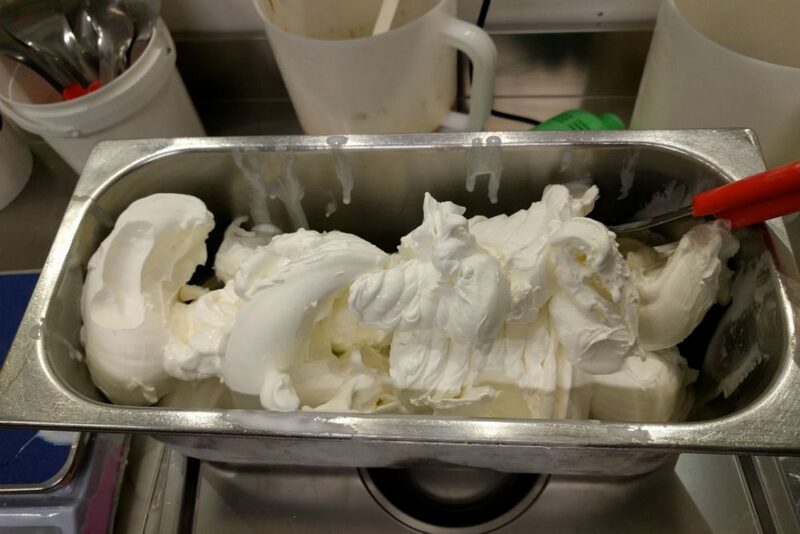 This is what the frozen gelato looked like before we added the flavorings. 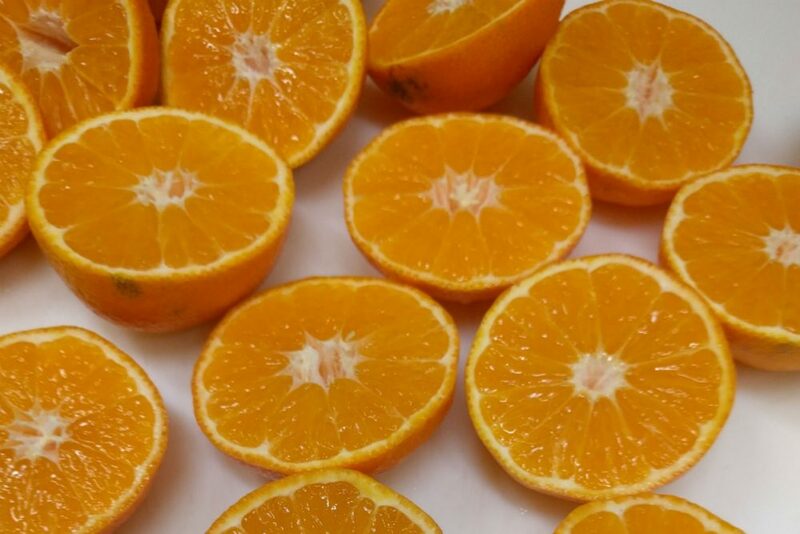 We used real clementines to make our clementine gelato. My mom and I were very proud of our creations. We also cooked delicious full meals during our trip. 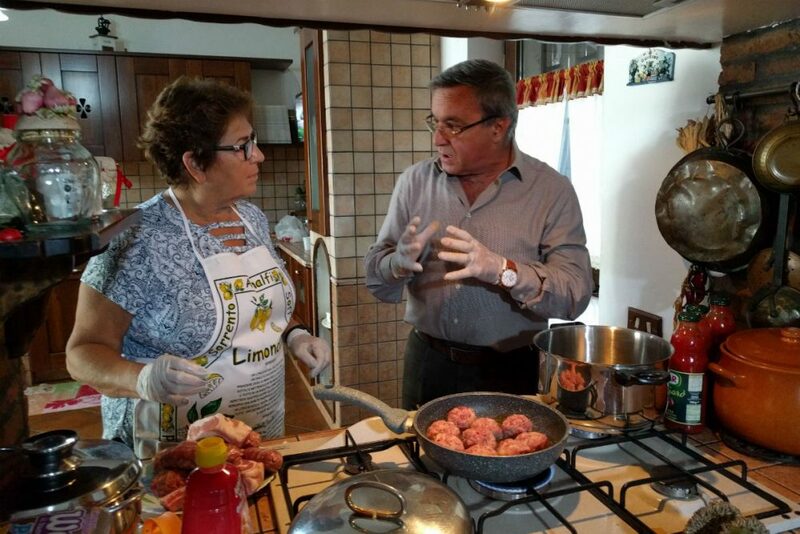 At Tony's house in Pompeii, he and my mom got serious about meatball construction. 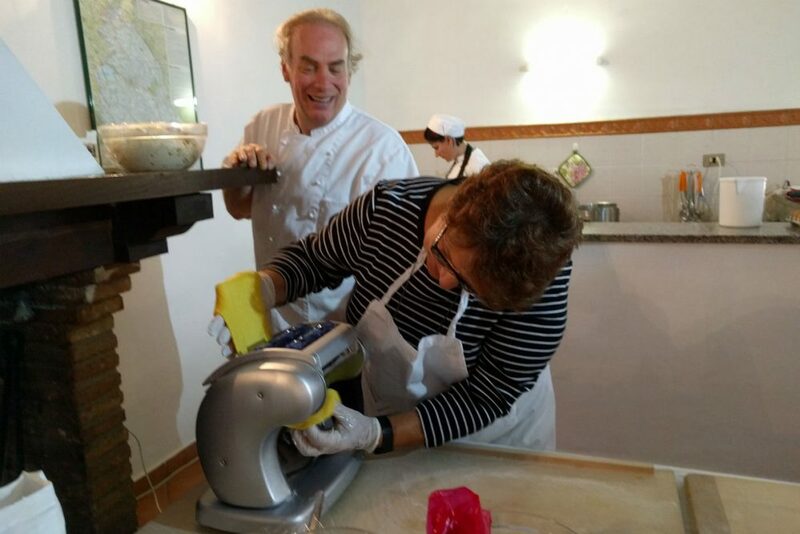 We pressed and filled fresh ravioli with Giuseppe at his agriturismo in Montefalco. 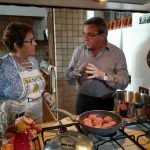 Ettore and Lorella made us feel like part of the family as we prepared dinner and then feasted together at their farmhouse near Spoleto. 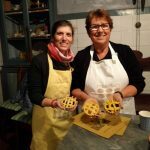 These were the crostata, little lemon-dough pies filled with homemade peach and blackberry preserves from Lorella's garden. My mom and I made them for Thanksgiving dinner when we got home from our trip. 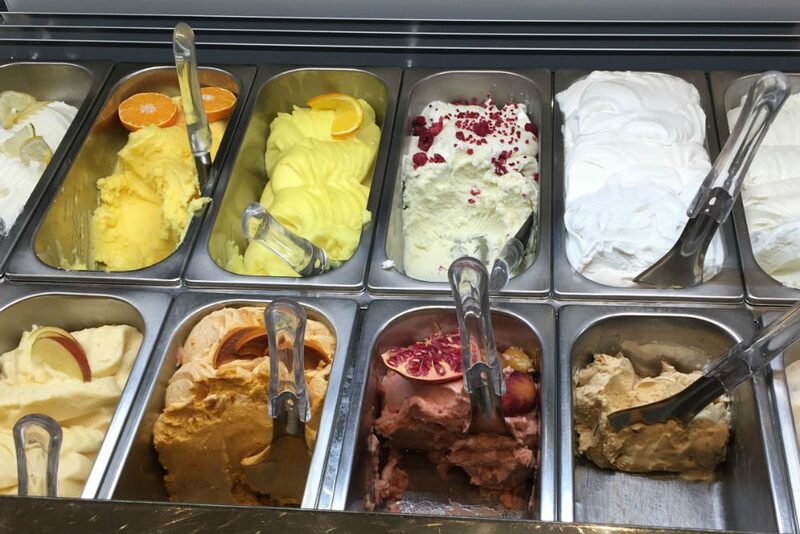 But in the end, our handmade gelato at Amandola Gelateria was still my favorite dessert. This might have been the best day of my life. 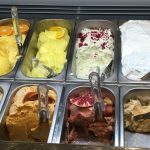 My mom and I learned to make gelato, from scratch, at Amandola Gelateria—and then chef-owner Ricardo let us try every flavor in the shop. 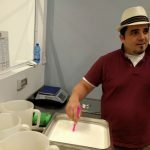 Ricardo is a pastry chef who used to work at a high-end restaurant, but he left to open his own gelato shop in 2017 and so far seemed to be quite happy with his choice. 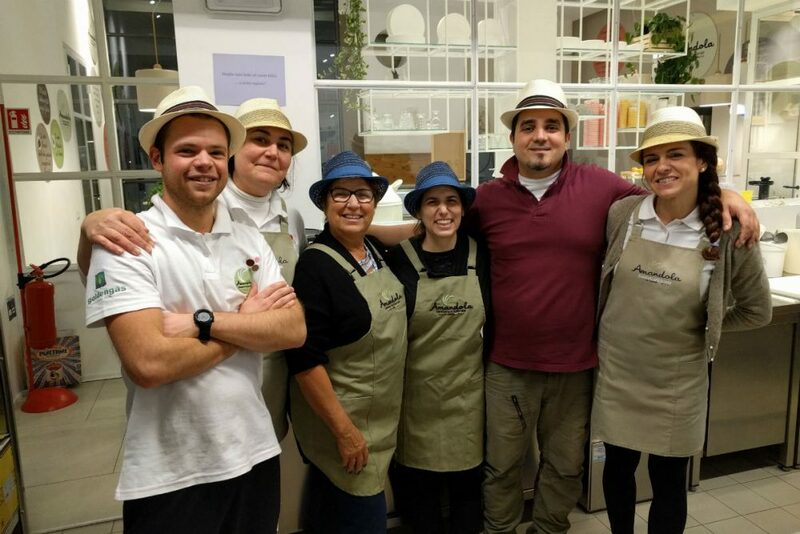 From the minute we walked in, he and every one of his staff was smiling ear to ear (though who could be unhappy in an ice cream store) and happy to show us every aspect of their set-up. 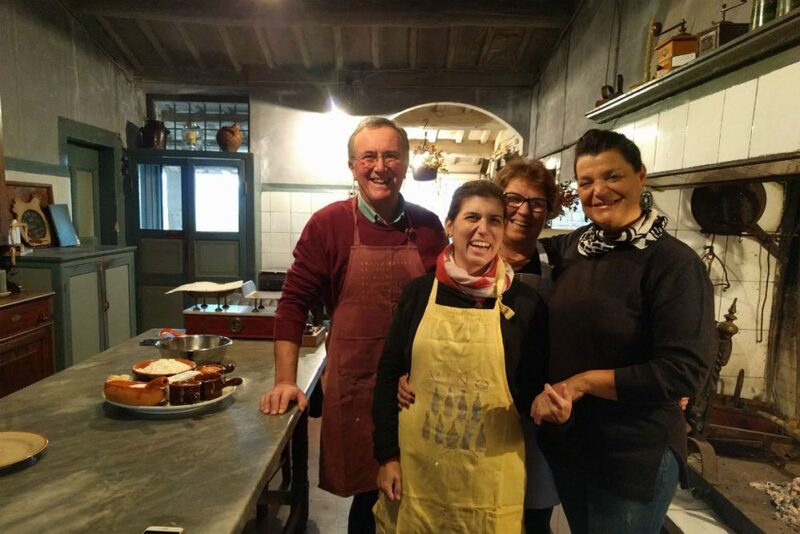 This immediate warmth was not at all unusual for our ten-day cooking trip through Umbria. 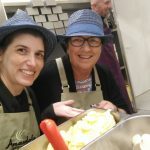 When I asked Maria Landers to plan a culinary vacation for me and my mom, the ideas she came up with were way more than what we expected. Case in point: We didn’t step foot in any cooking school the entire trip. Instead we met local families and cooked with them in their homes. 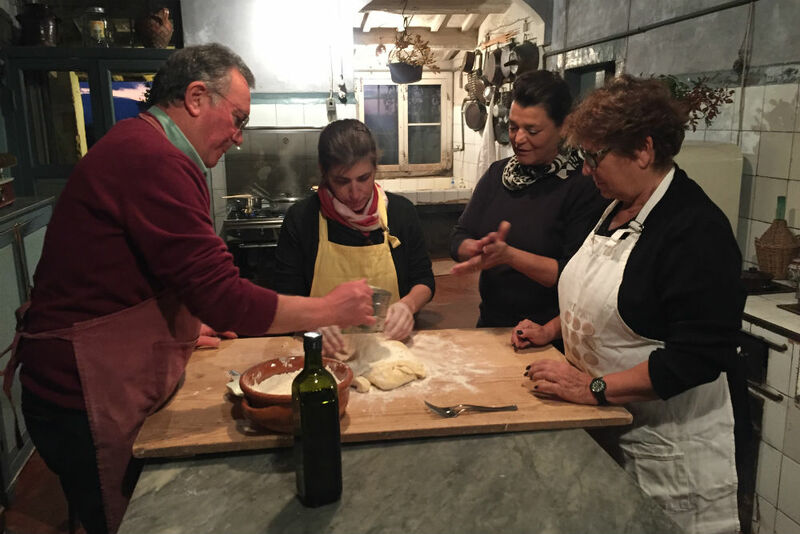 Tony grew up in Pompeii and is a guide at the ruins; we made fresh pasta with him and his daughter. 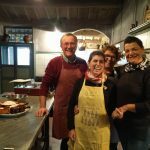 Giuseppe runs an agriturismo and together we made ravioli, vegetable flan, nut bread, and molten chocolate cakes; and we spent the evening with organic farmers Ettore and Lorella, who live in a farmhouse near Spoleto that has been in Ettore’s family for centuries. 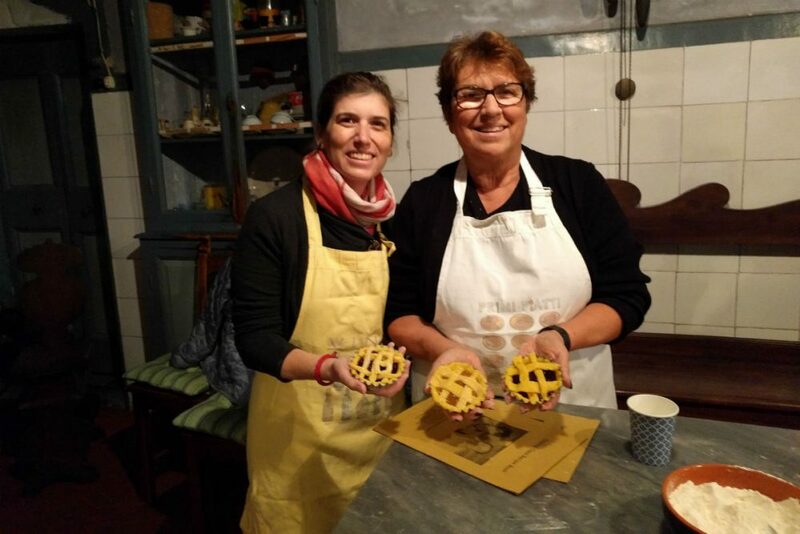 In a beautiful old-fashioned kitchen, we whipped up gnocchi, a local chickpea dish, and my favorite new dessert, mini lemon-crusted pies called crostata. 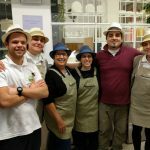 In all of these situations we were so warmly welcomed that we felt like we were part of the family as soon as we stepped through the doors. 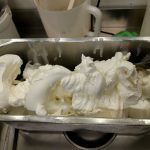 But while I loved all of the cooking experiences, this gelato night was a highlight for its sheer Willy Wonka-esque delight factor. 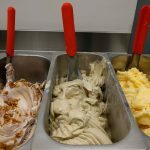 Once we handmade three flavors of our own choosing in the back kitchen, Ricardo led us up front, picked up the container of tasting spoons, pointed at the case of more than 30 flavors, and said, “What would you like to try?” I could have hugged him right there. Actually, forget Willy Wonka, everyone needs a Ricardo in their life. His gelato is some of the best I’ve ever tasted. No joke: you should all get on a plane and get to Foligno right now. 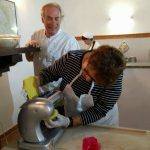 In addition to all the cooking experiences, our Italy trip included private tours of small artisanal businesses, including an olive mill (where we met locals who’d brought in their own just-picked olives to be pressed into oil) and a small-batch, biodynamic wine-and-goat-cheese farm, Calcabrina, run by two brothers. We toured their wine facility and cheese cave, and then got to meet the goats that make it all happen. Turns out, my mom is a goat magnet. When she walked into the field and started petting one friendly goat, I thought, awww isn’t that cute. Then another one ambled over for a nuzzle. And then two more. Next thing we knew, my mom was surrounded by adoring goat fans. Yes we had delicious pasta, cheese, wine, and chocolate on this trip, but absolutely nothing could have made it better than seeing my mom laughing so hard. Just watch the video above. Sarah was reading a prayer book in Hebrew when I came in. I know a few prayers so we sang one together. 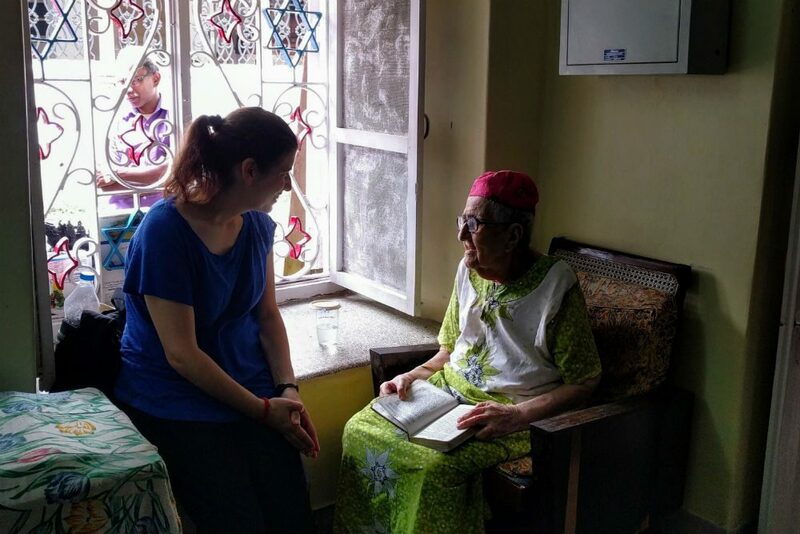 This November, I met one of the last living Jews in Cochin, India. Her name is Sarah Cohen and she’s 95. Her eyes lit up when she heard that I was a Cohen too, and then we sang the sh’ma prayer together. It was pretty amazing…especially considering I’d started the day at Catholic mass. Catholics are the majority in the state of Kerala, but they’re not the only religion. I knew there was some out-of-the-way Jewish history here—it was one of the reasons Cochin made it onto my itinerary, rather than the more-popular beach destination of Goa. Turns out, though, no one really knows exactly when the first Jews arrived here. What we do know for sure is that the Paradesi Synagogue in Cochin was built in 1598 by European Jews who’d convinced the king of Cochin to let them stay, and that a few—a very few—Jewish families still live in town to this day. I hardly expected to meet any of them, but as we walked the narrow lane leading up to the synagogue (called, I kid you not, Jew Street, in the neighborhood of Jew Town), our walking-tour guide pointed out two houses where those families still reside. When we got to Sarah’s Embroidery Shop, he saw that she was inside, and offered to make an introduction. What happened next is something I’ll kvell about for years to come. You can read all about it—and see video of Sarah and me singing together—here. 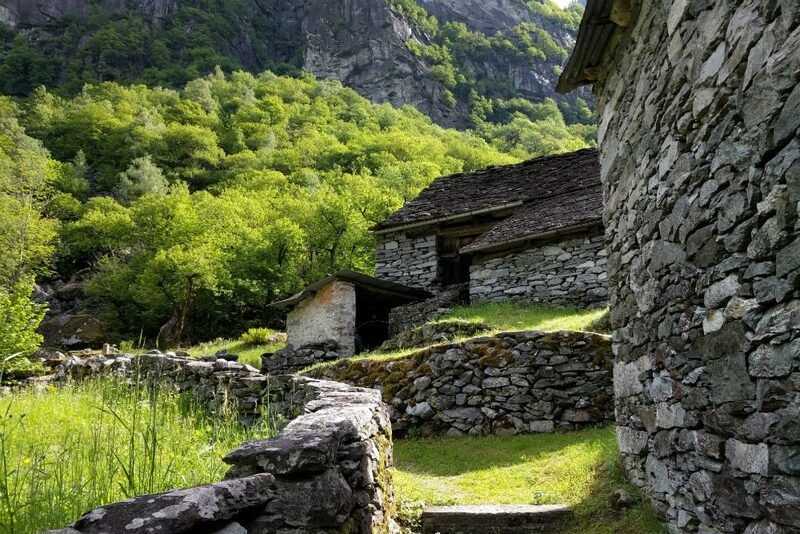 The valleys of Switzerland’s southern Ticino region are dotted with ancient stone villages still in use today. I have only one photo from my best day in Switzerland, and that’s because I dropped my phone right as it started. The ground all around me was carpeted in soft grass, but I found the one sharp rock to crack my screen on. The upside was that I got the rare-for-me experience of seeing a place solely through my eyes and not through my screen and note-taking app. Being forced to unplug was particularly poetic because the place I was visiting, the Valle Bavona outside the city of Locarno in southern Switzerland, is dotted with centuries-old stone villages where the residents still refuse to use electricity. My guide, Anna, spends summer weekends in a home like the ones we were seeing, so she was able to explain how the otherwise modern homesteaders accomplish daily tasks like laundry, gardening, and cooking, and how those who live high up the steep mountains use pulley systems to load in their supplies. Later we hiked an off-road trail dotted with ancient cave grottos still used by area residents to store cheese and wine. It was a gorgeous day in an out-of-time valley, each rustic village more beautiful than the next. I have no photographic reminders of most of it, but I will certainly never forget it. 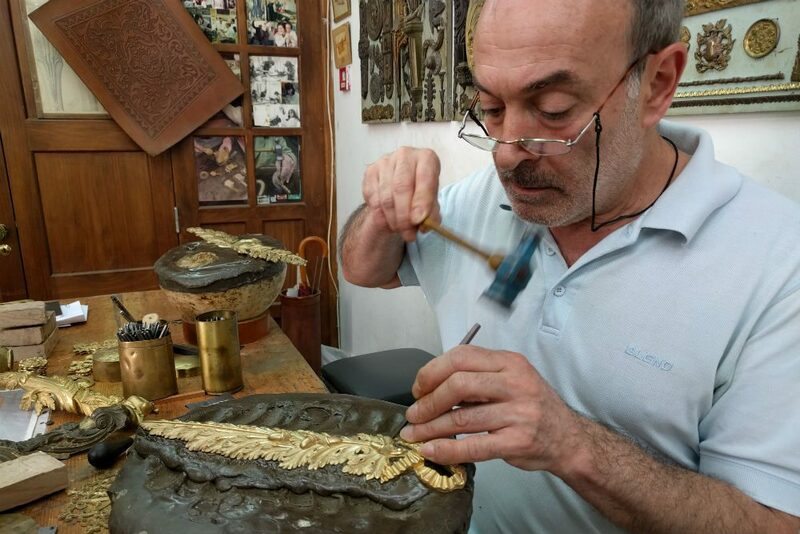 This brass carver was just one of the artisans I got to meet on my private behind-the-scenes tour of the workshops. 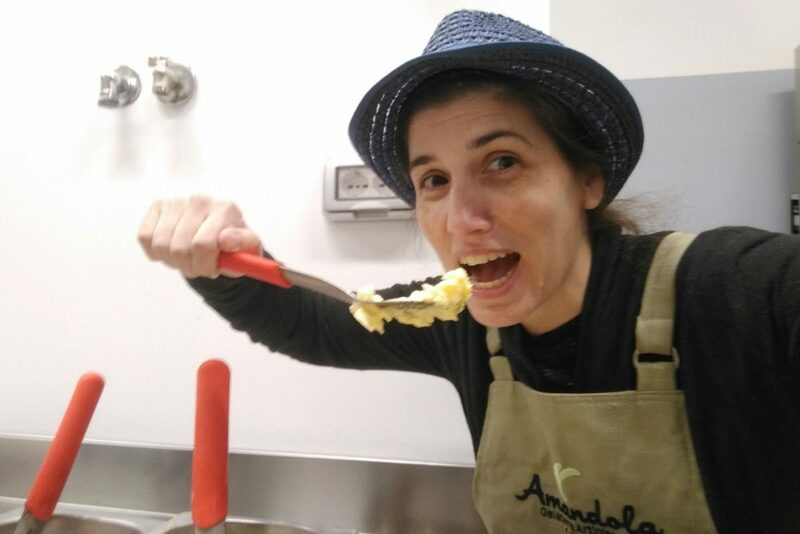 There are a ton of reasons to visit Lisbon, but in my opinion two of the biggest are the delicious local cuisine and the beautiful artisan craftwork. But instead of staying on the outside of the Lisbon experience—i.e., sitting down at any old tourist-trap restaurant and then meandering through the streets snapping pictures of the colorful building tiles—I spent a day going behind the scenes. My morning was all about food. 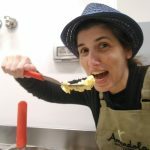 I spent it with a hip private chef, hanging out in her stylish boho apartment learning to make vegetarian versions of traditional local dishes while we chatted over snacks and music. My favorite: tomato rice with a sous vide egg—so good. My afternoon was all about the arts, for which I headed to the Foundation Ricardo do Espírito Santo Silva. Silva was a wealthy lover of the arts who donated his Azurara Palace and a chunk of his private collection to create the Museum of Decorative Arts in 1953, and founded a related school to preserve Portuguese craftsmanship. Today there is a building full of workshops adjacent to the museum, where skilled brass carvers, bookbinders, furniture makers, textile weavers, and tile makers hone their crafts, restore historic objects from around the country, and pretty much preserve a national legacy. And, lucky me, I got a private behind-the-scenes tour of those ateliers. In one particularly cool moment, I watched up close as an artist carved the decorative metal leaves that would adorn a piece of furniture I’d just seen in another room. Merely walking around Lisbon—a city with such visible history—is a treat in itself, but meeting the people who are still practicing those traditions elevates the entire experience. Plus, I got to try my hand at painting my own tiles. They don’t belong in a museum or on a building, but they look great in my apartment. The highlights of my travels this year were a combo of the most surprising discoveries, the most worthwhile experiences, and long-anticipated moments that finally came true. These are moments I wish for you in 2018.